DM - Nephrology, MD - Medicine, M.B.B.S. 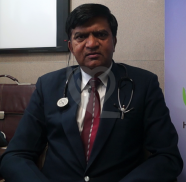 Dr. Ramesh Kumar, MBBS, MD(Medicine), DM(Nephrology), is a Senior Consultant - Nephrology at Alchemist Hospital, Panchkula. Prior to joining, Alchemist Hospital he has worked as Assistant Professor at PGI, Chandigarh. Apart from this, he was associated with Najran Hospital, Saudi Arabia and King Fahd Kidney Centre in Riyadh. Dr. Kumar is an alumnus of the prestigious institute, Post Graduate Institute of Medical Education & Research, Chandigarh, where he accomplished his post graduation in Medicine followed by super specialization in Nephrology. Dr. Kumar has contributed numerous research papers to various peer- reviewed journals nationally & internationally. He is a member of various professional associations and participates in conferences & workshops actively.